In the ongoing Miva vs. Shopify Plus battle, e-commerce companies must be selective when choosing the best platform for their business. It’s not just a matter of getting a store up and running, but rather how the platform will continue to deliver a desirable (and profitable) shopping experience. Shopify has now rolled out Shopify Plus, a sleeker, upgraded, lemon-scented version of Shopify with new features the traditional platform doesn’t offer. 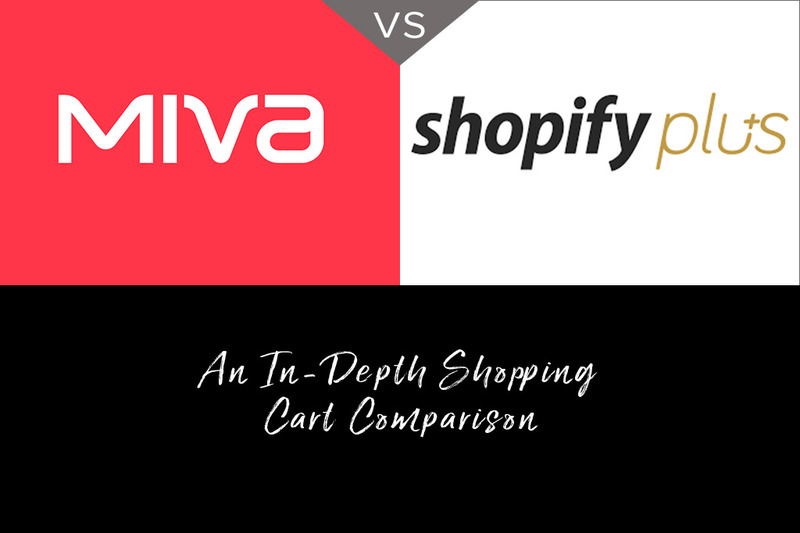 But before you hop on the 2.0 bandwagon, it’s prudent to compare the benefits of Shopify Plus with Miva, a platform that has historically performed better than its competitor. Shopify Plus is packed with features that aren’t available with a regular Shopify account. The new platform is mainly geared toward high growth or well-established e-commerce stores, or those that are more complex or custom in their store experiences. Their website claims the upgrade was developed for managers or store owners that don’t have much time to grow their business because of the complex requirements of their existing platform (e.g. the traditional version of Shopify). Shopify stores typically share server resources, which can limit a larger company’s ability to scale. In order to grow and maintain an adequate website speed, stores would have to pay for additional servers, storage, or other resources. Shopify Plus eliminates this challenge by giving stores a dedicated server. Traffic spikes, especially on holidays like Black Friday or Cyber Monday, don’t pose as big of a threat, giving store owners a chance to scale without fear. However, Miva has always been suited for large businesses to mitigate issues associated with shared resources. Miva provides dedicated cloud hosting and can add additional resources, such as storage, memory, or processing power) in just 60 seconds. Shopify Plus is touting its support as one of its competitive advantages, and compared to regular Shopify accounts, they’re right to do so. Regular Shopify accounts do not have dedicated support, or even an in-house team. From build to launch, you either have to do it all yourself or find a third party developer to do it for you (the latter is quite expensive, by the way). Shopify Plus brings a whole new level of support to the process. You can get support every step of the way to get your website up and running, and then to keep it working. It’s a useful and much-needed feature, but it still doesn’t quite stack up to Miva. One of Miva’s biggest advantages is that it always offers unlimited support, regardless of which merchant plan you have, and it’s not hard to access. Miva has an in-house team that knows the product inside and out. So big enterprise companies and small mom and pop businesses alike can get the help they need to design, build, launch, and maintain their website. Of course if you want a more personalized experience and a dedicated account manager, you can always contact our team here at Glendale Designs. We live and breath Miva and have worked with the platform since version 1.0 (no kidding). Regular Shopify stores are extremely limited where customization is concerned, especially during the checkout process. In fact, the checkout process is limited to a few basic styles. Shopify Plus is a huge step up from regular Shopify stores because of the increased customization opportunities. You can customize nearly every aspect, including the cart and checkout process, without losing any security or scalability. Again, this is nothing ground-breaking. Stores are increasingly focusing on delivering a standout user experience while also differentiating themselves from competitors. Customization is critical in helping companies separate themselves from others and catering to their unique customer base. And yes, Miva’s customization includes a variety of options for the checkout process. Shopify Plus touts itself as an affordable e-commerce option, with plans starting at a minimum of $2,000 per month. The final cost actually depends on store volume, so the price could be well above this threshold. However, part of their cost-effectiveness comes from the major discounts they offer on payment processing options, especially on Shopify Payments. However, Miva still comes out as the more cost-effective option, delivering a scalable SaaS platform while saving merchants the costs involved with plugins and other add-ons. Basic platform features and prices aren’t the only things to consider. The shopping cart is one of the most critical parts of any e-commerce website because the right features can positively impact your success. For starters, abandoned carts plague the e-commerce industry, with an estimated 80% of online shopping carts being abandoned. It’s important to choose a platform that will help you combat this statistic and recoup as many abandoned sales as possible. One of Miva’s most powerful shopping cart benefits is its abandoned cart saver. Users that leave the website for whatever reason can return with their items still in their cart, provided the items are still available. Miva also makes it easy to set up abandoned cart campaigns that let you send reminders about items left in a shopping cart. Studies show that abandoned cart emails experience a 45% open rate and nearly an 11% transaction completion rate. Shopify just recently started including their abandoned cart features on all plans, whereas they only used to be available for higher-priced plans. Like Miva, Shopify offers saved abandoned carts and email targeting to help recover sales. Both Shopify Plus and Miva offer strong inventory control that can be a major money and time saver. You can set low inventory and out of stock inventory numbers for every product, and even hide out of stock products from your audience. It’s easy to manage multiple product variations, such as a flower vase that comes in six different colors. In addition, you can receive emails when items are running low or out of stock and stay on top of your product ordering. Both platforms allow to you to display related products for upsell opportunities. However, Miva’s scalable features let you create custom attribute templates that can be applied to a variety of products to save you time. It’s true that Shopify Plus offers a lot more features in the way of inventory. They have apps to help you run just about any piece of your inventory puzzle as you need. You can bulk edit tags and products, get out of stock notifications, manage bundle inventories, and even notify customers when a product comes back into your warehouse (all of which are included in Miva, regardless of plan). However, these features are generally offered through third-party apps that were built for Shopify. They’re not included in your Shopify Plus service, which means you’ll have to budget for them. Both Miva and Shopify Plus offer a variety of payment gateways, from credit cards to gift cards to third-party gateways like PayPal. Shopify Plus also offers Shopify Payments, a program that allows you to accept credit cards without incurring a transaction fee (credit card fees still apply). Both platforms also make it easy to create discount codes or special offers on the fly. It’s easy enough for merchants to do it themselves rather than contacting a developer and getting a massive bill for it. Miva goes the extra mile and allows you to set up recurring billing for subscription-based services via Miva Pay. You can do this with Shopify, too, but you will need to integrate a third-party service that specializes in it. Shopify Plus doesn’t offer this as an available built-in feature. In short, they’re both packed with cart features that can make a real difference in your bottom line. However, many of Shopify’s extra features aren’t actually offered by Shopify, but rather via third-party developers. And with each additional app comes an additional (often monthly) price. Miva offers an extremely feature-rich shopping cart without the higher price tag of Shopify Plus. This is a huge win for small businesses who want to be able to compete with larger stores but don’t have the funds. Both Miva and Shopify Plus can set up your e-commerce store for a successful venture. They’re both heavy in desirable features and usability for front-end and back-end users. But Miva still holds a competitive edge in many ways. The traditional Shopify platform has been touted as a minimum viable product, offering businesses the “bones” of what they need but relying heavily on third-party integrations for a fully functioning storefront. Shopify Plus is certainly a step up, but it’s still equated to a minimum viable product made for enterprises. Miva was carefully designed so that users don’t have to rely on these outside apps to get the functionality and experience they want. When you have a bunch of apps built into your website, you can expect a disjointed experience when it comes to receiving support. Shopify Plus support will only service issues and questions related to Shopify, not the third-party apps you’re using. Miva provides a seamless experience in every aspect so that downtime is minimized, questions are answered with a single phone call, and experience is never lacking. Naturally we would love if you call Glendale Designs as your preferred Miva Solutions Partner. Miva has been a core choice among shopping carts since its inception in 1997, and the company continues to innovate its products. It has partnered with over half a million merchants throughout its career and has been a part of over $100 billion in transactions. Some of the country’s biggest brands use Miva, including Cintas, HAAN, Fireball Whiskey, and The Paper Company. They cater to major brands and small businesses alike, giving you access to all features regardless of your monthly plan, so you can grow your business the best possible way. Plus, they’re based in San Diego, an area rich with some of the nation’s top tech talent that can continue pushing the brand and its features forward. Every piece of data related to your e-commerce operation is protected by Miva. They use a 256-bit SSL and meet all third-party security requirements and compliance. They also include a free SSL certificate for your first year of service, although you will have to purchase your own for each subsequent year. Of course the platform itself is PCI compliant as per the PCI Security Standards Council’s PA-DSS validation process. If you want to see Miva’s features in their best light, you can take a full 30-day trial absolutely free. You deposit the cost of a full month of the service, then receive a refund at the end of your trial. For comparison, Shopify Plus only offers a 14-day trial. This doesn’t give you as much time to test its features and play around with the interface, especially considering it takes some time to set up a store and test the various workflows. It also doesn’t include you access to its third-party apps, although many of them will also offer a free trial before they start billing you. The Final Verdict: Miva or Shopify Plus? It’s hard to argue with the fact that Shopify Plus has upped the ante. Their features are in high demand and are a major improvement over traditional Shopify accounts. However, they’re not anything extraordinary when compared with what Miva offers. Miva has had many of these advantages in place long before Shopify made them available in their Plus version. And unlike Shopify, Miva makes all of their features available to all their customers, regardless of whether they’re in a lower pricing tier. Miva continues to set the trend when it comes to e-commerce platforms. Their 20+ years experience in the industry has allowed them to pioneer the best features we use today and continue to improve their platform. Let us help you craft a standout shopping experience with Miva. You get the most advanced features on the market for less than what you’d pay for a highly marketed brand like Shopify so you can keep more cash in your business. Contact us today for a consultation!